After completing an undergraduate degree in creative writing in Melbourne, Australia, I was looking into opportunities for further study. I’ve always loved books, and was working casually as a shelver in the university library where I had undertaken my degree. A friend from work had enrolled in a distance learning Masters in Information Studies at Charles Sturt University (also in Australia) and convinced me to give it a try – I fell in love with it almost immediately. Since graduating in 2014, I have worked in public and academic libraries in Australia, before moving to Scotland in 2016. I worked at an academic library in Scotland before going full-time at the Scottish Poetry Library (SPL). 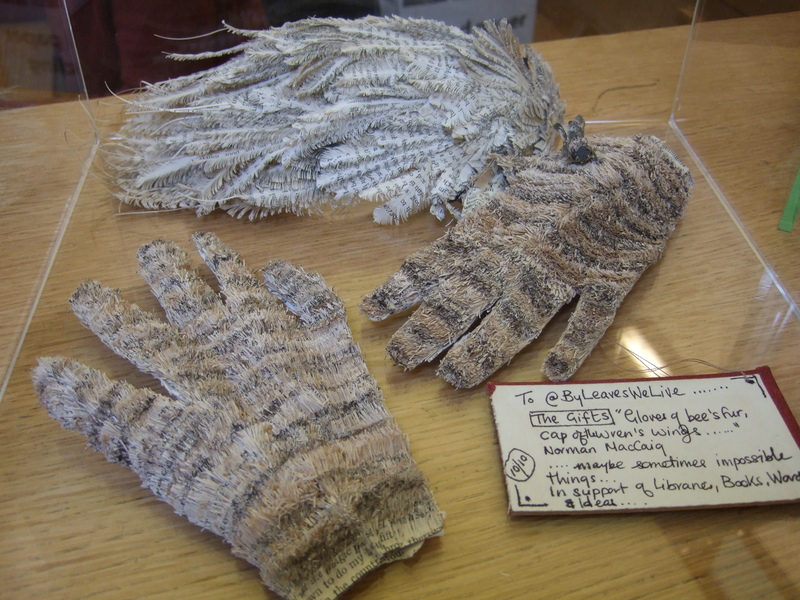 The SPL has a very unique collection, and is not governed by any larger organisation or council, so we have an unusual amount of autonomy in how we manage our collections. This also means, however, that the collections benefit from a wealth of specialist knowledge. I was very lucky when I started to be working with staff who had spent decades developing these collections, and also got a crash course in Scottish poetry while doing so. Constantly reading poetry helps with ongoing training! The focus of our collection! Poetry libraries are not common, and we are a national authority on Scottish poetry. We also have a largely physical collection, mainly due to lack of funds to support digital resources. This means I still update and maintain collections that some people might refer to as ‘old-fashioned’, like our cuttings collection which is largely comprised of actual newspaper and magazine clippings focused on Scottish poetry that we manually locate, cut out, and catalogue. Working with poetry, and cataloguing. There aren’t too many libraries these days where the cataloguing is done in-house, and it is one of my favourite activities! Where do I start? I hold lead responsibility for the enquiry service, and my favourites are the ones where people ask you to identify a fragment of poetry that they have forgotten the origin of. It’s usually a 50/50 chance that we will actually locate an answer for some of the more unusual or rare fragments, but we do our best! Other enquiries come from students doing dissertations on Scottish poets. I did some extensive work for an academic locating mentions of grandmothers in the work of Jackie Kay. 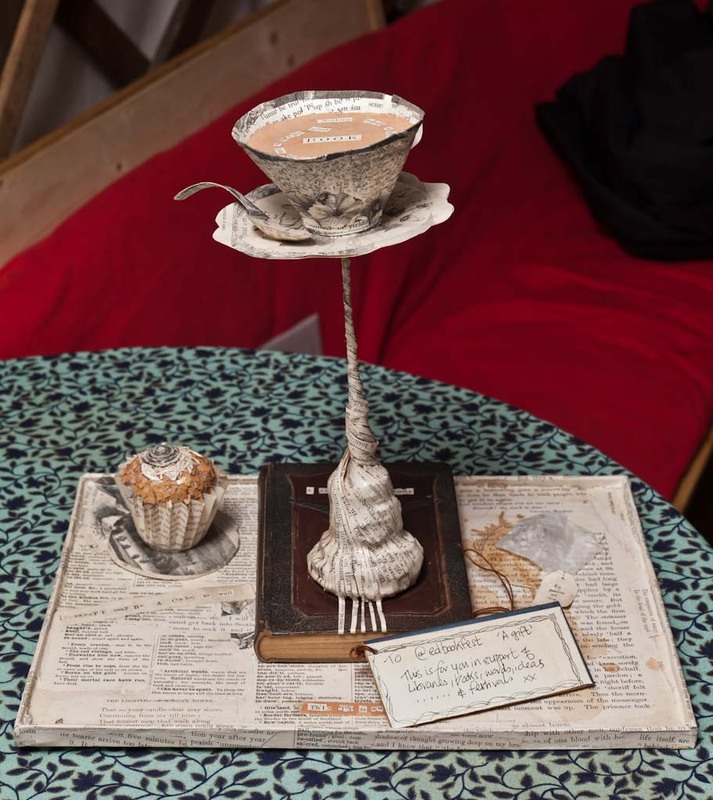 There are also ‘lost’ poems that we have been asked about several times over the years that still elude us – and one of them is about the ‘cludgie [toilet] on the stair’ in a Glasgow tenement. If anyone has heard of this one, do get in touch! And, if you’d like to submit a mini-quiz of your own, you can find the details here: mini-quiz. 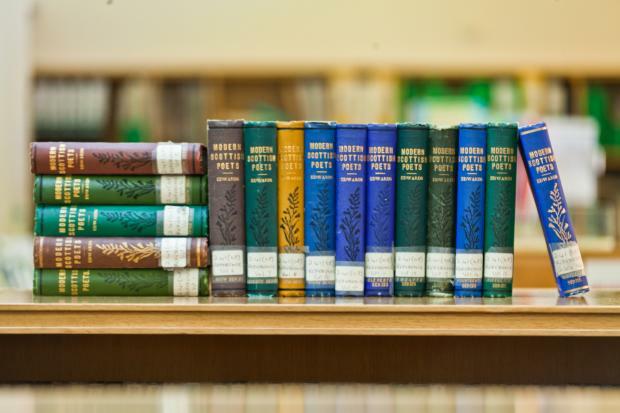 The Scottish Poetry Library is now recruiting for two positions, a full-time Library Administrator, and a part-time (Saturday) Library Assistant. 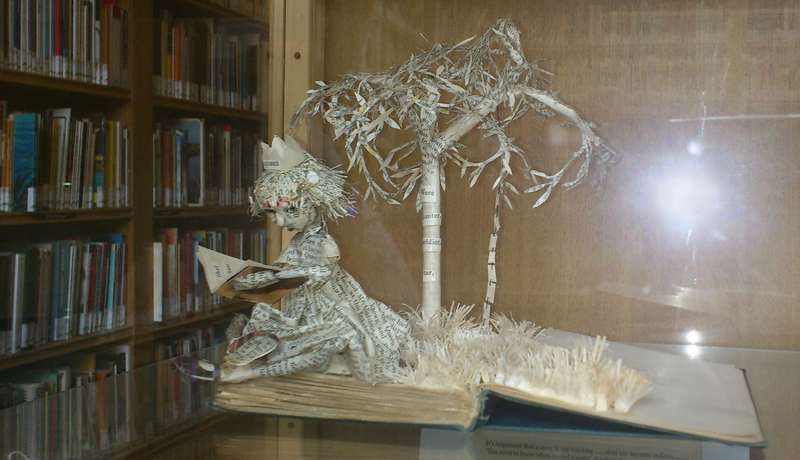 Edinburgh is a city of libraries and organisations which support literature. Libraries are particularly under threat as we become ever more digitised and funding is spread more thinly. 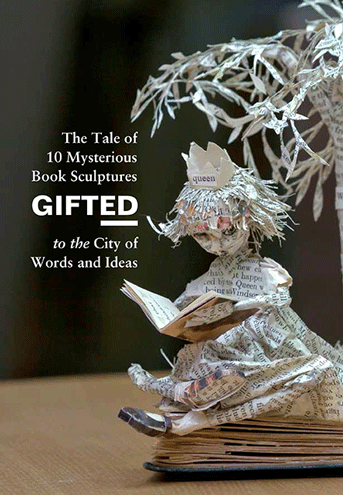 The book sculptures were made as gifts in appreciation of libraries, books, words, ideas and placed anonymously, without anyone being aware of the donor, to be uncovered unexpectedly. Surely a perfect gift? 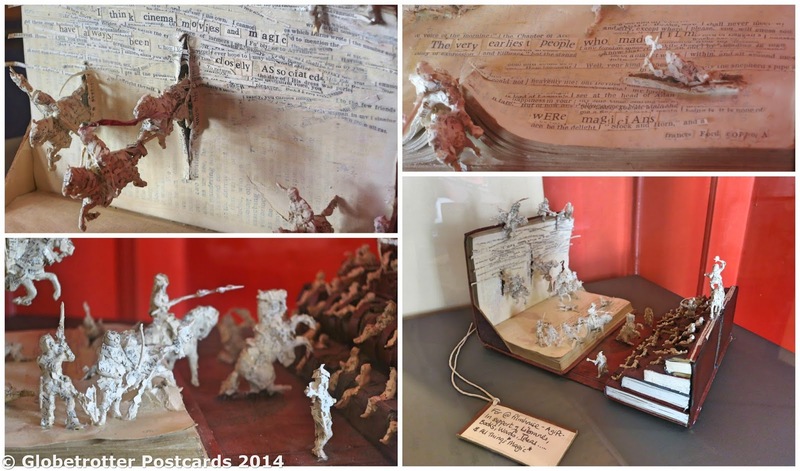 At the Conrad Festival [in Kraków, Poland] I was able to show images of the paper sculptures and explain the references to poems hidden within a few of the loveliest. 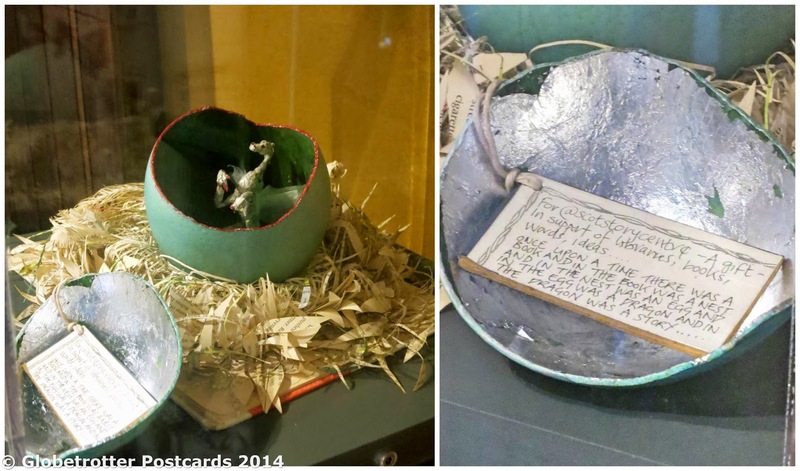 Edinburgh Filmhouse – “all things magic” … with the film coming alive ‘out of a book’… and with a tiny Ian Rankin, the sculptor’s favorite Edinburgh author, seated in the cinema! Goblets so clear light falls on them like a stain. The good and ill that make of me this man. Vainglorious image to all we’ve said and done. To the greedy vanity that disfigures you. I have to give. And is that possible? We thought that was it but, since then, there have been more and more; three recently with the theme ‘Free to Fly’ including one more for the SPL and one more for the UNESCO City of Literature Trust. All are exquisitely crafted and include rich references to the body receiving the anonymous gift. They have been created with care and love. They celebrate more than the tangible word: they commend our values, our hopes and dreams; our belief in the transformative power of books, of literature. There is a beautiful, well-illustrated book written about them by Robyn Marsack, Director of the Scottish Poetry Library (SPL). Appropriately titled ‘GiftED’, it was published by Polygon in 2012. 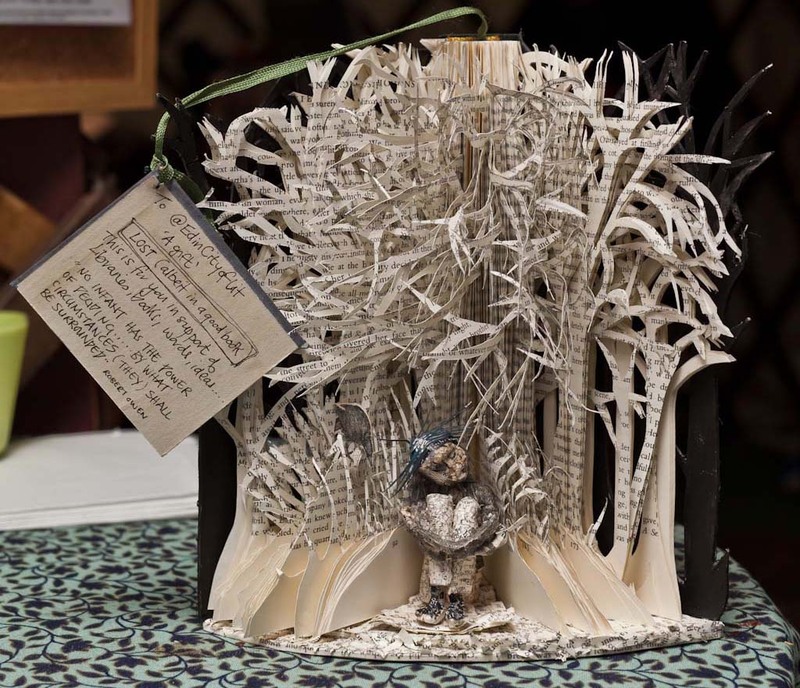 Give to the Scottish Poetry Library this Christmas! The Scottish Poetry Library needs to raise £120,000 for the building renovation which will hugely extend our reach. Every donation counts, so spread the word! Text LEAF70 £5 (or LEAF70 £10) to 70070.